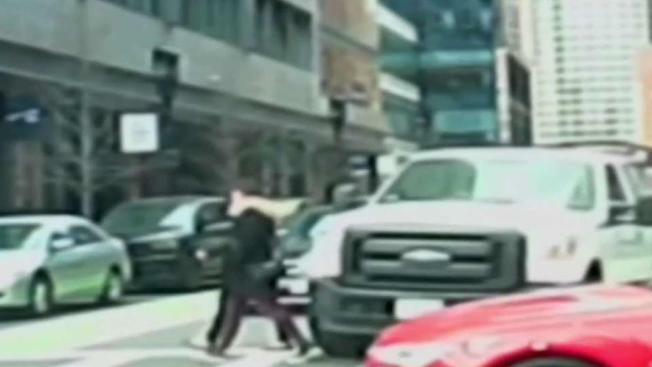 A woman was injured when she was hit by an erratic driver in a stolen Amtrak vehicle in Boston's Seaport District just before noon on Friday. At least two vehicles and a traffic signal were also struck. The Amtrak pickup truck was driving erratically down Northern Boulevard when it hit an Uber car right in front of the federal courthouse. Video from the scene showed significant damage to the rear driver's side of that vehicle. The truck continued on, striking a female pedestrian. It kept going, hitting a second vehicle and then a traffic light, at which point it blew a tire. The male driver then got out of the pickup truck and took off running into a nearby parking garage. Aerial footage from NBC10 Boston's Sky Ranger showed a white pickup truck stopped alongside the road, surrounded by more than a half dozen police officers. The vehicle has an Amtrak logo on the side, and Amtrak said the vehicle was stolen from a worksite in Boston earlier Friday. The pedestrian suffered a foot injury but her condition was not immediately known. She was conscious and alert as she was loaded into an ambulance.